Enjoy a delicious, picture-perfect omelet without the mess! 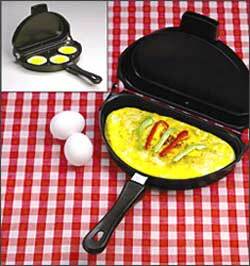 This Omelet Pan actually folds your omelet - fillings and all - for you. Simply press the button to flip one side, then the other. That’s all there is to it. No fuss, no muss, no mess! It’s also great for making pancakes, crepes, and blintzes. Non-stick surface.